How much do we know about Apoquel’s safety? Quite a lot, I would argue. The short-term safety profile, based on the data collected during multiple randomized-controlled trials at recommended doses looks good. In a 28-day study of 436 dogs , the prevalence of diarrhea, vomiting, anorexia, and polydipsia were low (1.4-2.3%) and similar to the placebo-treated group (0-1.8%). In most cases, the signs resolved with continued dosing of Apoquel. Similar results were found in other RCTs. 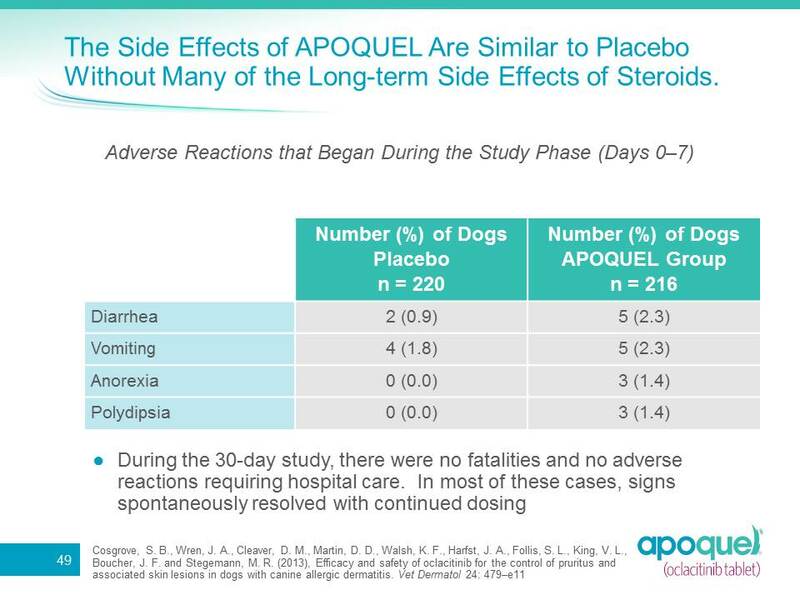 In a 28-day study of 123 dogs comparing Apoquel to prednisolone (0.5-1.0 mg/kg, once daily for 7 days, then every other day for 3 weeks), Apoquel compared favorably in terms of speed of onset, efficacy, and prevalence of adverse reactions. In the Apoquel group, about 10% developed pyoderma, versus 6.5% in the prednisolone group. This is probably not a statistically significant difference (6 dogs vs. 4 dogs) and a lower prevalence than I would expect in a population of dogs with allergic dermatitis. The prednisolone group had a higher prevalence of elevated liver enzymes (18%) than the Apoquel group (5%), as we might expect. Three dogs (5%) in the Apoquel group were reported to develop Malassezia dermatitis. 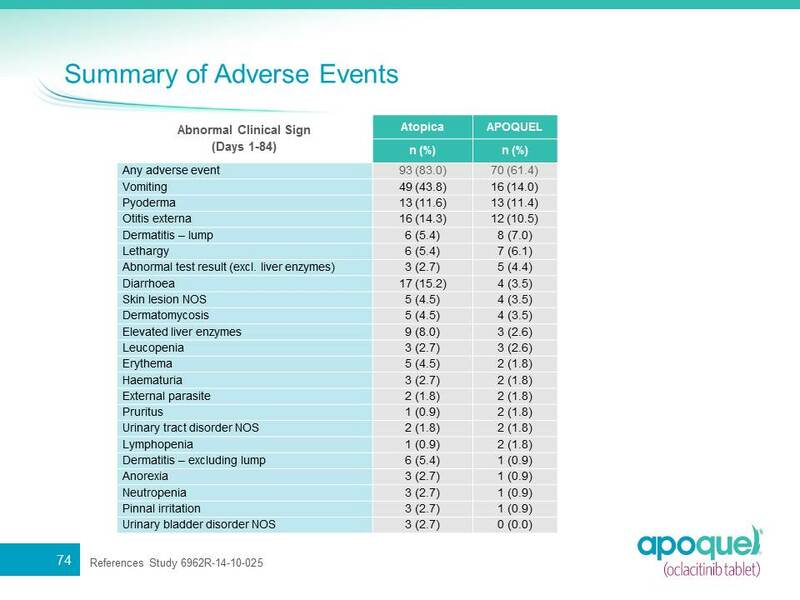 Other adverse events in this study were infrequent (0-2 dogs) in the Apoquel group. An 84-day RCT comparing Apoquel to Atopica® (cyclosporine) in 226 dogs found that vomiting and diarrhea occurred with a greater frequency in the Atopica group (44 and 15%) than the Apoquel group (14 and 4%). I suspect that the higher rate of vomiting seen for Apoquel in this study compared to some other studies relates to its longer duration. I have personally prescribed Apoquel for more than 50 dogs representing thousands of doses and have had very few clients contact our office regarding suspected adverse reactions. So, if these clinical studies all sound good, why is there still concern amongst some about prescribing Apoquel? It stems from the target safety laboratory studies, often using 3 or 5 times the recommended dose, or giving it to young dogs, for which it is neither recommended nor approved. These are the studies that led to the recommended age restriction and dosing of a drug which admittedly represents a balancing act between the right amount and too much! Remember, Apoquel is like fine wine or anything else you are can overdo! In the target safety studies, some of the concerning findings are dermatitis, interdigital furunculosis (apparently common in laboratory beagles), demodicosis (in 6-month old dogs), pneumonia (in young dogs treated with high doses), lymphadenopathy, decreased cellularity of other lymphoid tissue, and mild hematological effects. Of the 4 dogs euthanized during the target animal safety studies, infection played a role in each. Their Apoquel dosing for all of them was 6 to 12 times the recommended daily dosing and they all initiated treatment at less than 6 months of age. Is this risk too great to use Apoquel? I don’t think so. What if a pharmaceutical company was doing a similar target safety study as required by the FDA with prednisone, giving it at 6-12 times the recommended dose to young dogs for an extended period of time? Wouldn’t you expect that we would see some immunosuppression related infections as well as other side effects? Does that stop you from ever prescribing prednisone to alleviate a pet’s suffering? No, because you use the correct dose in practice! Ideally we would evaluate the prevalence of each diagnosis against a database of dogs with a comparator group with similar demographics. But of course that isn’t readily available. So we are left to consider whether the prevalence of neoplasia in these 239 dogs (5%) is unusually high. My local veterinary oncologist and I don’t find the prevalence unusual, although we don’t have all the demographic data that would help us evaluate it. For the record, I do not have any financial conflicts of interest concerning Zoetis. I’m just a fan of Apoquel. For me, Apoquel is living up to expectations and I am very glad we can help out so many dogs. It needs to be used at recommended doses and under careful veterinary supervision. Let’s not forget how miserable it is to be itchy and how that negatively impacts quality of life and the human-animal bond! In future posts I’ll discuss the patient monitoring that I recommend for Apoquel and how I incorporate it into my treatment with RESPIT to manage the underlying allergy. This entry was posted in allergic dermatitis, apoquel, Atopic Dermatitis, Uncategorized and tagged allergic dermatitis, atopic dermatits, canine, dermatology, dog, pet, veterinary dermatology, veterinary medicine. Bookmark the permalink. It saddens me to think innocent dogs who are completely healthy are tested with a drug the killed when the drug makes them sick. I want to try this on my severely allergic dog but just don’t feel the risks are worth it at this point, nor do I agree with the testing all these drug companies do on healthy, innocent animals. Peter, I understand where you are coming from, but target animal safety studies are required by the FDA to register a new drug, not done simply by choice of pharmaceutical companies. You mention that you would not want to subject your pet to risk, but the risks would not be fully known prior to drug launch if the target animal safety studies were not conducted (if that were even an option). Of course, Atopica is also contraindicated with a history of cancer, based on the type of medication that it is, so it may not be appropriate for your bulldog if she indeed has cancer. Since you seem to have quite a bit of knowledge with Apoquel, I wanted to ask a question. My dog has been diagnosed with environmental allergies (via skin tests) and IBS (via scope). She has been on allergy desensitization shots for over a year, and is still itchy. After three days on Apoquel, she vomited (has not vomited in over 6 months previously). Per vet’s instructions, I lowered the dose, and a week later she vomited. It has eliminated her itchiness, so I would really like to keep her on it. You indicated in your article that a small percentage of dogs experienced vomiting during the study, and that the vomiting resolved itself with time. Do you know how long it took to resolve? Note, my dog has been a very complicated case – more on the IBS side. She takes amoxicillin, prilosec, and slippery elm, and is on a limited ingredient diet to manage the IBS. The percentage of dogs that vomited while taking Apoquel was similar to the percentage in the placebo treated dogs. So while it is feasible that it might cause vomiting in an individual, it is certainly not a common side effect at all in the studies or in my experience with about 100 patients. As you indicate, your dog has several other possible causes of vomiting to consider. Excellent article. Thank you. After reading the boring, dry, very scientific studies this was a nice change of pace for a “civilian” pet owner. My dog (black lab mix, 5 yrs old, 78 lbs) has been on Apoquel for 60 days as of today. And tomorrow will be her first day off of it due to the national backorder. We’re now forced to give her Atopica again, which was VERY expensive and had quit working, and was the reason for the vet visit 2 months ago. I’m hopeful that the Atopica will work again, at least temporarily, since it’s been out of her system for so long. But I’m not counting on it. I refuse to put her back on Pred for more than a small dose every few days because she was on it daily for about 1 1/2 years straight, and I don’t want to shorten her life more than I may already have shortened it with the steroid. Apoquel has been a miracle. I have kept a daily log of her reactions to the Apoquel, and none were outside of the typical reactions I’d read about on the Zoetis site and other sites. All of the initial reactions happened in the first 10 days, all were mild, and all cleared up within a few days at most. Zoetis, please get on the ball and get this medicine back into the marketplace. Thanks for the comment. It seems like those of us who ordered Apoquel when it was first launched will be receive an allotment this month. It is limited, but your veterinarian may have some more for your dog soon, depending to a large measure on how many patients they have to ration their supply amongst. How safe is this drug? I am very cautious about it. We have a 4 year old English bull dog who has food allergies and environmental allergies. Our vet just started him on this drug and he seems to be zoned out on it and I worry about the drug’s safety. Be sure to bring this to the attention of your veterinarian. If the lethargy is in fact related to Apoquel, it would be an unusual side effect in my experience or compared to the data generated by Zoetis. I did have one owner report a bit of lethargy that only lasted a short while, even while he remained on Apoquel. Apoquel is definitely a miracle for my bulldog. The only other meds that worked in the past were prednisolone and we all know the side effects that brings. As for the lethargy – mine was a little lethargic during the initial 2X/day dosing, but it waned as he got used to it and in fact, he went the opposite way once we were on the typical 1x/day. He’s almost 12, and we didn’t realize how badly the allergies were affecting his life until he was on Apoquel. He started playing again for the first time in years. Don’t get me wrong – he did play occasionally and got excited at the usual things like walks and ball in the yard – but since he isn’t fixated on itching 24/7 he has some brain energy to spend elsewhere. Our English Bulldog has been on this med for 60 days, I noticed a knot under her arm last week pop up, took her had it aspirated and it is cancerous. She will be having the tumor taken off this Friday. I am no longer thrilled with this drug! I am sorry to hear about the diagnosis. It may still turn out to have low grade malignancy after the biopsy. For instance, mast cell tumors are very common in dogs, representing 20% of all cutaneous tumors in dogs. But they can vary quite a bit in their malignancy. Overall, Apoquel hasn’t been demonstrated to increase the risk of developing cancer, but hopefully your veterinarian will report your pet’s findings to Zoetis once the biopsy is done. No conclusions can be drawn from one patient since many dogs develop cancer, but there is a process in place for identifying potential problems with drugs after they are released based on a large number of reports. Thank you for your reply. Our dog is in surgery right now and when the biopsy results return as to the stage I will ask my vet to report it to Zoetis. I also went back and read the precautions for Atopica and realize it’s not an option either. Fortunately, this was the first year this dog had problems with allergies. We do have another dog who has used Atopica in the past and this year we changed him to Apoquel. Now we feel this is a game changer and plan on stopping him on the Apoquel also. I’m wondering if the RESPIT alone will help him, we are in need of a new plan. Fortunately we only experience allergies in the spring and summer usually starting around March. In the past we have been able to stop using meds in the fall. We also has a good results with Apoquel but now after cancer we are cautious. The tumor removal is triple the price of a spay so we pray no more tumors pop up. IMO the risk did not outweigh the benefits. I do hope for a safe alternative medication without the risks eventually. RESPIT helps about 70% of dogs with atopic dermatitis achieve a “good” or “excellent” response, as rated by the veterinarians prescribing it. My chocolate lab who is 11 recently started Apoquel after having ear infections her whole life. We bounced between ear cleansers, flushing and Pred when it got really bad. She really did not know what it was like not to have an ear infection. I was thrilled when Apoquel was available in December 2013. Then early January, I noticed a lump on her left side. It was not soft like the fatty tumors she has had before. I was told to just watch it but it continued to get larger and became hard. I took her to the vet in mid-April and the tumor was aspirated which showed a lot of different cells, so we scheduled its removal May 9th. It was determined that it is a mast cell tumor and we are still waiting the result of the biopsy as to what stage it is and what treatment options we may have. She had a mast cell tumor when she was 4 years old but nothing since then. I am of the belief that she may not have been a candidate for this med with her mast cell history. Two dogs developed them during the study. I feel guility that I did not question the side effects and am disappointed that my vet did not recall her history (from her record) of the previous mast cell tumor. I pray this turns out well for my closest companion and have learned to question vets like I used to question pediatricians. I do want to report that while on Apoquel she was infection free at last for the 3 months she was on it and that was wonderful! Thank you for your helpful comment. As you learned, it is good to do your homework and speak up in these situations. A caring veterinarian should welcome your input, concern and advocacy for your pet. I wish the best for her recovery. Why does a dog have to be a year old to be put on Apoquel? In the target animal safety studies, some young dogs taking high doses of Apoquel developed demodectic mange and signs of other infections. The approval was therefore limited to dogs older than 12 months. My dog was fortunate enough to get on Apoquel at the tail end of the trial, and was then grandfathered in, so that we were able to continue the medication after the trial was over. Most vets were unable to get any Apoquel, so we felt lucky, since the drug improved my dog’s quality of life tremendously. Unfortunately, my pup ripped open a Kong toy and swallowed one of those large squeakers and another large piece of plastic, and they lodged in his intestines. He had emergency surgery to remove these items, but went downhill the following day. The skin around the incision was red and tender, and his temperature and blood pressure were sky-high. They had to open him up again and discovered that the tissues around the incision were dying, as was the section of intestine pressed up against the incision. After debridement and intestinal resection, they closed him up and crossed their fingers. None of the vets had ever seen anything like this – a healthy and athletic (and very large) four year old mutt … but his immune system wasn’t working correctly. If it were allergy to the sutures, it shouldn’t have been so massively severe so soon after the first surgery. His tissues kept dying and his extremities began to swell. We had to put the heart and soul of our house to sleep, to put him out of pain. What happened? Well, it’s already been reported to Pfizer as a ‘suspicious death’. Apoquel is in the spotlight here because it was clear that my dog’s immune system was severely compromised. Of course, allergy to the sutures is also being looked at as well. This is something that the trials didn’t cover – how a dog would do in surgery while on Apoquel. He did stop Apoquel over 24 hours prior to surgery, since he had been throwing up his food, and supposedly Apoquel is out of the system within 24 hours of the last dose. I remain very suspicious and am working with all the vets to see what the blood and tissue tests show. P.S. As an aside, I have some experience with medications that work on the immune system. I have AS (ankylosing spondylitis) and take a TNF inhibitor, which essentially suppresses the immune system to a degree. That’s a gross overgeneralisation, but apt. If I need to have surgery or even slightly invasive procedures (or even if I get a bad flu), I need to go off my TNF inhibitor (Simponi), since it can retard the healing process and even allow infections to spread unchecked. Apoquel is an immunomodulator, so I would expect similar cautions. This is why we’re investigating whether Apoquel could be involved with this horrible event, which involves a healthy dog’s loss of life due to an immune system breakdown after surgery. Steve, I am sorry for your loss. It is good that your vets reported this to Zoetis, as it is only with more widespread use that uncommon events are uncovered. Agreed – and any vet treating a dog with Apoquel is basically required to report any health issue that could even tenuously be tied to Apoquel. We got the test results on Dash back yesterday, and it was apparent that there had been a massive failure of his immune system to fight off opportunistic bacterial infection. It was, however, e-Coli and Klebsiella that killed him. He never had perforated intestines, but even a small amount of these types of bacteria in an immune compromised animal is a dangerous thing. Our surgeon had contacted several other surgeons and veterinary specialists about this occurrence, and they all agree that this is way outside of the norm. In fact, the only cases that even come close to this are oncology patients, where the immune system is intentionally suppressed. Considering that we’re talking about an extremely healthy and athletic four year old dog, the vets all agree that this is suggestive of a connection to Apoquel. And the fact that it spread to the danger point less than 18 hours after the first surgery, and death occurred 48 hours after that surgery (we euthanized Dash, but he was hours away from a painful death). There’s no way to know definitively, of course, but that’s why all of the lab reports and doctors’ notes are being sent to Zoetis. I really hope this doesn’t happen to other dogs, but feel that this could certainly happen if dogs on Apoquel have bowel surgery, where exposure to e-coli, klebsiella, and other bacteria is a factor. By no means do I think that Apoquel should get pulled from use – but I think they need to create guidelines for surgery if a dog is on this medication. At least Dash’s final year was more comfortable, without all the damned itching and sores that his allergies caused. Unfortunately, the cure was more expensive than we could have imagined. Would Apoquel be helpful to use instead of Atopica in a dog with perianal fistulae? I would not expect it to be helpful for perianal fistulae, but have not heard of any reports trying it either. My 6 year old Shih Tzu was on APOQUEL for over a year. It worked but now we found a lump on his neck which turned out to be salivary gland cancer. This is rare for dogs his age so I don’t think this is a coincidence . Luckily it was removable and we are starting radiation. I caution others from using this drug. I’m sorry to hear about Figgy’s salivary gland tumor, however, an isolated case like his cannot be linked to Apoquel. Hopefully it got reported to Zoetis,and if more cases show up in the hundreds of thousands of dogs treated with it compared to a similar population, you may be on to something. Until then, many veterinarians and pet owners are thankful to have this treatment option. From Cassidy’s dad. While researching Apoquel, as my 9 year old Cocker Spaniel is on it, I found lterature that Dr Hines, a vetinarian, stated on the internet, – that Apoquel may shorten the life of a dog due to the processes that occur within the animal’s body, when on Apoquel. Have you heard this type of statement and does it make any sense to you? I think Dr. Hines makes a lot of good points in his online article on Apoquel, but I don’t know of any study that would suggest that Apoquel is known to shorten dogs’ lives. Largely, his article suggests that we should use Apoquel only when needed, keep an open mind because the studies to date have been funded by Zoetis, and monitor our patients closely for side effects. I would agree with those items, but I still have plenty of patients for which Apoquel is worth the small risk, considering the alternatives.